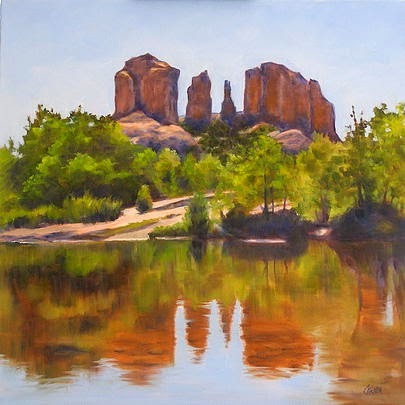 Carmen Beecher won 1st Place for this painting, Cathedral Rock in the Contemporary Fine Art International Fall 2014 Competition. Seamus Berkeley was the juror for the competition. He describes his selection process, "I always base winning selections on composition, drawing, values, edges, color, color temperature, ranked in that order of importance. The most significant aspect of any painting is composition and the one that requires the most careful consideration even before starting a work. The last element, color temperature, usually requires significant painting practice to understand and apply. The use of color temperature was what helped me decide the final order of winners." Congratulations Carmen Beecher ! You are a great talent, the picture is beautiful, very well deserving of recognition.Well done Carmen!